Serie A champions Juventus face a daunting task when they head to Bergamo to face Atalanta on Boxing Day. The Old Lady have set a league record 49 points (16 wins, 1 draw) of the 17 matches played so far this season. Last Saturday’s hard-fought win over AS Roma means that Juventus maintained their 8-point lead over second placed Napoli. Atalanta meanwhile come in on the back of a resounding 3-1 defeat at the hands of Genoa, and currently occupy ninth position in the table with 24 points. 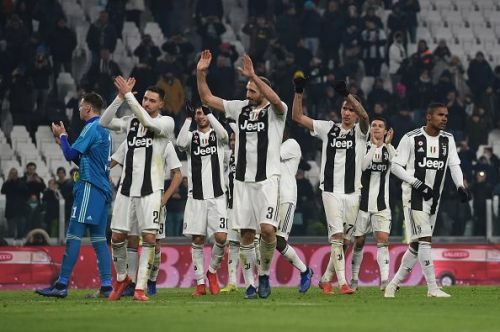 Juventus have drawn 2-2 in their last two league visits at the Atleti Azzurri d’italia against Atalanta, although they did win there in the Coppa Italia earlier this year. Atalanta come into this game without some of their key players including Rafael Toloi, who scored an own goal in the defeat to Genoa and was later on sent off. Jose Luis Palomino is also suspended for the encounter against the champions. Marten De Roon’s injury suffered against Genoa is not as bad as first feared. The Dutchman is expected to be out for the next two weeks. Juventus have a near full-strength team to pick from, although head coach Massimiliano Allegri pointed out he could ring some changes, most notable Cristiano Ronaldo being given a rest. Allegri said after their win over Roma that it is a 50-50 situation and that he will make a last-minute decision whether to include the Portuguese talisman. Juventus: Szczesny, De Sciglio, Bonucci, Chiellini, Sandro, Pjanic, Can, Matuidi, Douglas Costa, Dybala, Mandzukic. Juventus are looking for their 9th straight league win against an Atalanta side struggling for consistency in the Serie A this season. A trip to Bergamo is one of the most difficult matches for any team in the league, but Juventus could not have chosen a better time to play Atalanta.